I am not sure whether to thank or curse whoever put the confounded socks on the list. It has been a project of many false starts. First I chanced upon a ‘sock knitting kit’ in Lidl for less than £5, and thought my luck was in. It came with wool, needles and instructions, and I hastened home to get started. Well that was a month ago. Closer inspection revealed that the instructions assumed a basic knowledge of knitting that I was lacking. The pattern was written in some sort of code. Nothing to explain how the wool got on the needles, or indeed why there were 4 needles. Utterly incomprehensible. Back to square one. And so I did the only thing that one can really do when faced with an insurmountable housewifely task – I asked my mum. She produced a sack of knitting needles, 2 balls of wall, and a pattern for baby’s booties. That would do, I thought. Youtube educated me in how to cast on; and I was off! Thought the whole job would be concluded before I returned from the Czech Republic. Alas. This pattern too descended into gobbledygook. ‘With RS facing, knit up 10 sts up first side of instep, work across 10 instep sts thus: K2 tog twice, K2 (sL 1 K K1 psso) … what the ****? I took it all home again, and asked my mum. She studied my efforts. Then professed the entire piece to be so riddled with errors that it was beyond her powers to salvage anything from it. Start again, was the maternal advice. I consulted you tube, and found a baffling array of methods involving circular needles, double ended needles… all manner of suggestions that baffled and confused me. And each method threatened to take many hours. So, I thought, I’ll do it freestyle. Who needs a pattern!? If I knit a patch of wool in the shape of a sock, and then do another one, and stitch them together – surely that is a sock!? Why make it so hard! So I did. And here it is. And here it is again, actually on a foot. I think we can all agree it is hardly worth investing time to complete the pair. 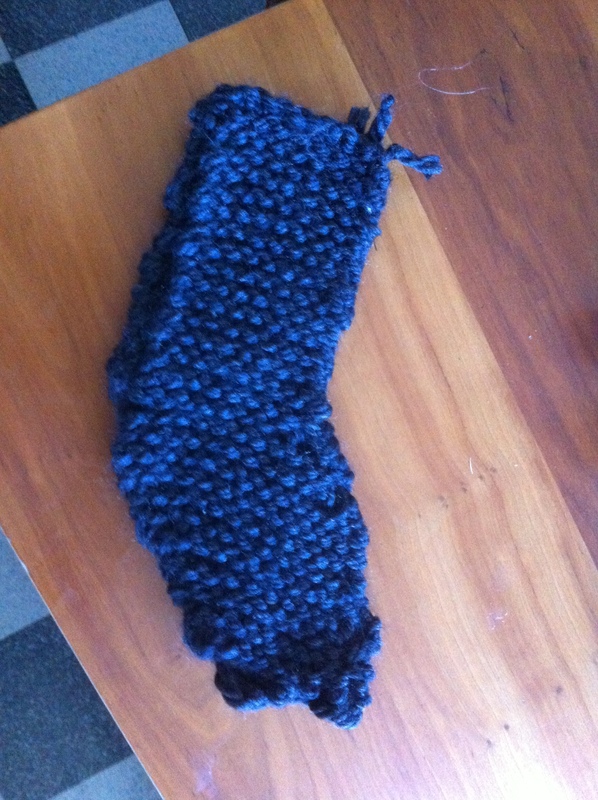 In conclusion then, socks are rather ambitious, but I am excited to have discovered the joys of knitting. It is a very surprising turn of events. Of all things that appeared among the 100 I did not expect knitting and busking to be topping the list for enjoyability! And yet, so it is. Astonishing. 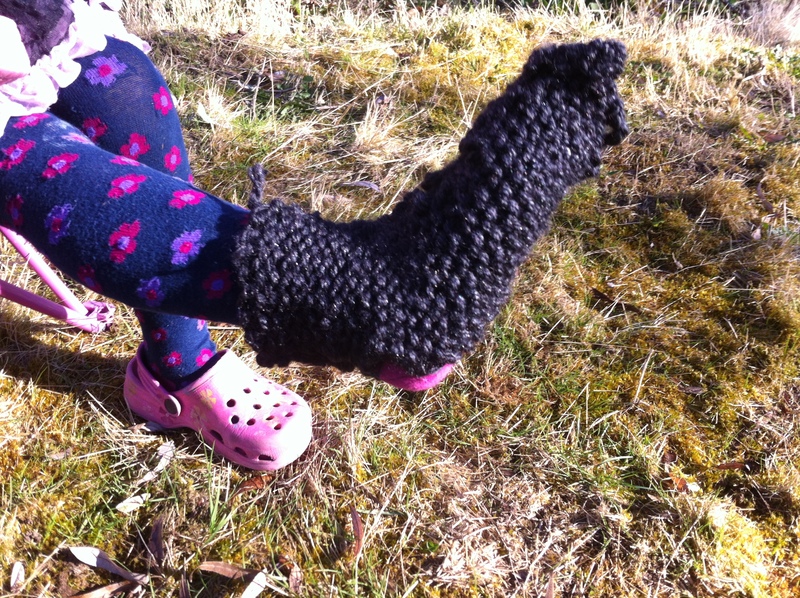 This entry was posted in creative, family, humour, new experience and tagged knitting. Bookmark the permalink. Hi! All your adventures sound fantastic – the challenge reminds me a bit of that book ‘Julie and Julia’. I’m the head fundraiser for a charity called MusicSpace and wondered if you would use any of these challenges to raise money for us? We use music therapy to help people with mental disabilities and it would be so great if you were on board! Please do let me know and we can help promote your cause together!